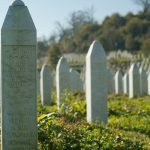 This video was made by our Community Champions in Kirklees for the 21st anniversary of the genocide in Srebrenica. 11 people answer the question: “What can the people of Kirklees do to stand against prejudice, injustice and hatred?” in no more than 21 seconds. A diverse rage of people from schoolchildren to MPs give their thoughts on this important topic to mark the 21st anniversary of the genocide in Srebrenica.